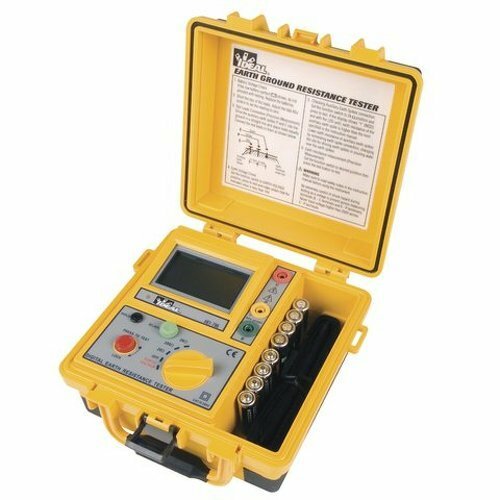 The Ideal 61-796 earth ground tester performs 2-point and 3-point fall-of-potential or simplified ground resistance testing when it is not possible to use auxiliary ground stakes, and measures ground voltage for new and existing buildings, structures, equipment, and electrical systems. The auto-ranging feature automatically determines the correct value range for the measurements. The data hold function with screen icon allows the user to retain the measurements on the display for manual recording. The battery indicator alerts the user when batteries are low to ensure accurate measurements. When in use, the 2 milliAmp (mA) measuring current does not trip ground fault breakers of the circuit under test. Ground-resistance meters are used by electricians and contractors working in industrial, utility, and field servicing. 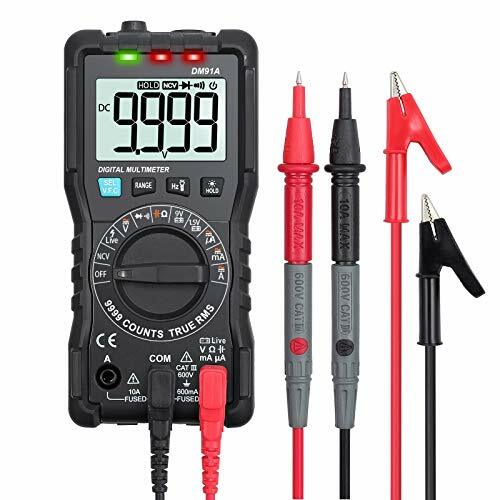 The Ideal 61-796 tester comes with a set of three test leads, two auxiliary earth spikes, a simplified measurement probe, a hard carrying case, and an instruction manual. Applicable safety standards are IEC/EN 61010-1 and Installation CAT III 200V. The meter is rated for use at pollution degree 2. Specifications Earth resistance ranges and resolutions 0 - 20 range (0.01 resolution); 0 - 200 range (0.1 resolution); 0 - 2000 range (1 resolution) Earth resistance accuracy + or - 2% reading + 2 digits or + or - 0.1Ω Maximum earth voltage 0-200V AC, 40-500Hz Earth voltage accuracy + or - 1% reading + 2 digits Operating humidity 80 percent Operating temperature 32 to 104 degrees F Power source (8) 1.5V AA batteries (included) Weight 1361g/3lbs. (including batteries) Dimensions 210 x 210 x 100mm (H x W x D) H is height, the vertical distance from lowest to highest point; W is width, the horizontal distance from left to right; D is depth, the horizontal distance from front to back. Ground-resistance meters test the condition of a grounding system, and provide resistivity measurements in ohms. The meters are available in digital, analog, and clamp models. Grounding systems protect people and equipment, and provide a safe path for the dissipation of fault currents, lightning strikes, static discharges, EMI and RFI signals, and interference. Regular testing of a grounding system is important for safety and protection of equipment. For example, corrosive soil with high moisture content can degrade ground rods and connections in existing systems and increase the resistance of the system. 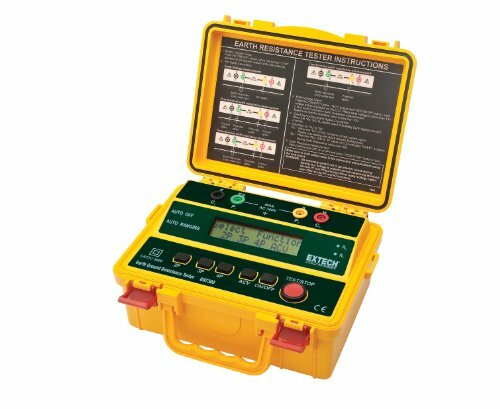 Ground-resistance meters are used in conjunction with a variety of testing methods to troubleshoot intermittent electrical problems or as part of a regular maintenance plan. Ideal Industries manufactures test and measurement equipment, electrical supplies, and tools, among other products. The company, founded in 1916, is headquartered in Sycamore, IL. High Quality Material This PM 5203 Earth Resistance tester is a professional instrument in detecting ground resistance of the electrical equipment. Upgraded from the traditional ground resistance meter with its circuit, structure and techniques. Now present as fashionable, precise and easy operational. 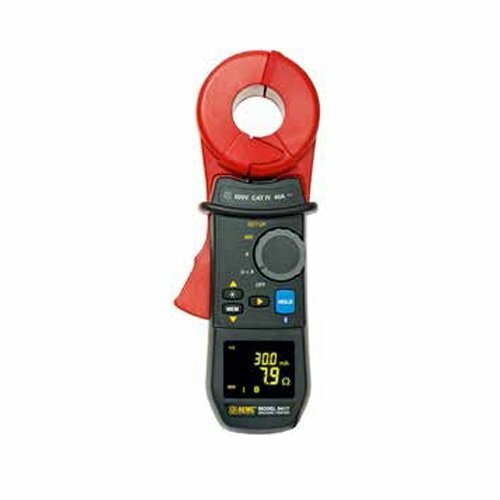 Measurement Mode Gear selection,you can choose the measurement range you want,so that you can use in many situations.Powered by 6 AA batteries (NOT included).This Earth Resistance tester also has Maximum/minimum/average measurement function.It Can also be used to AC/DC voltage measurement and continuity test. Automatic calculation of PI (polarization index) and DAR (dielectric absorption ratio). Easy Reading This Digital megohmmeter has Large digital LCD and backlight applied to the meter facilitate users to read the information on LCD.Large-screen high-definition backlight: Press the backlight button to turn the backlight on or off.And this Earth Resistance tester Display: has analog bar and digital dual display function.Under voltage indication.This Earth Resistance Test the insulation resistance with 50V-1000V voltage. 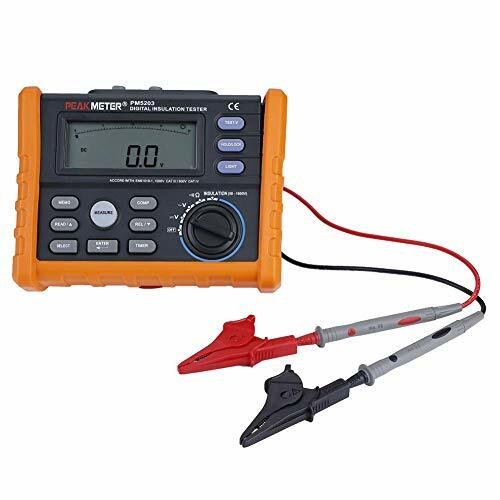 Widely Used Resistance Meter Tester is small and easy to carry. 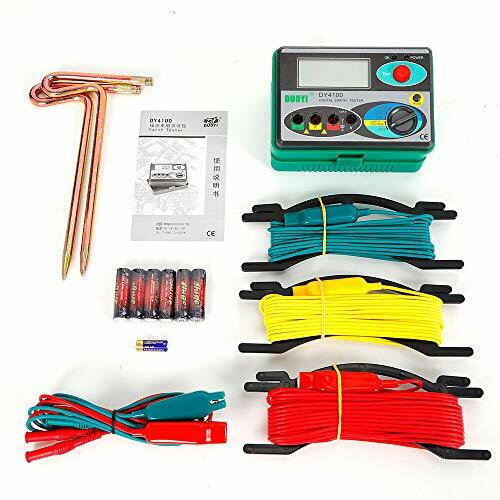 Applicable to the shop, postal, railway, roommate, chemical, communications, mining and other departments to measure the grounding resistance of various devices,such as Suitable for high voltage tower measurement, grid grounding measurement, lightning rod measurement.Check the insulation of high voltage electrical equipment such as motor, transformer, cable, etc. Excellent Design This grounding resistance meter has double insulation protection for safer measurement.The multi-slot card-type protective sleeve is closely fitted with the meter, so that the meter is non-slip and anti-fall.The meter is capable of storing up to 28 groups of measurement data.Lock function: lock data during insulation test.Timing function: timing function during insulation test.Automatic discharge: the meter will automatically discharge when the load is capacitance. The flashlight and backlight are separately designed, there is no embarrassment that two lights lit up simultaneously. 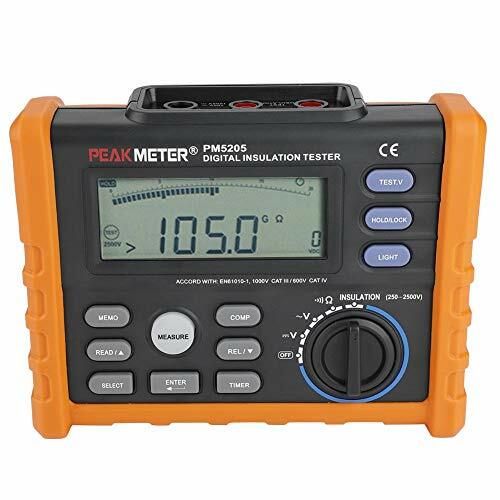 The digital multimeter will automatically shut off with 15 minutes no operation to save consumption. Built-in support backstand for hands-free use, durable rubber cover protects the multimeter from dropping & falling accidents. View larger Clamp-On Ground Resistance Tester Model 382357 Clamp-on Ground Resistance tester enables non-contact measurements of ground conductors without the need for auxiliary ground spikes. Comes with 9V battery, resistance check plate, metal storage case, and user manual. Optional NIST Certificate of Calibration with data available (Model 382357-NIST). View larger Additional Features Measures resistance from 0.03 to 1500 and True RMS AC Leakage current from 0.2mA to 30.00A. 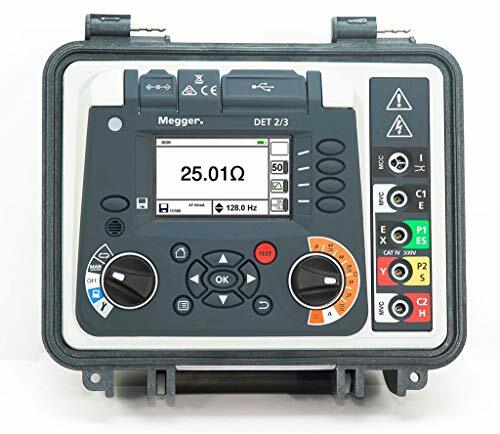 It features programmable datalogging with 116 points, programmable hi/lo alarms, 0.9 jaw size, self-calibration when powered on, and verification resistors to confirm the accuracy of the meter. Cat III-300V. Applications Clamp-On Ground Tester simplifies ground resistance measurements on multiple-point ground systems. Use to verify the resistance of cellular and communication tower ground grids, check utility transmission systems and grounding rods, perform maintenance on electrical transportation systems. Ideal for verifying ground systems in sub-stations, factories, and office buildings. 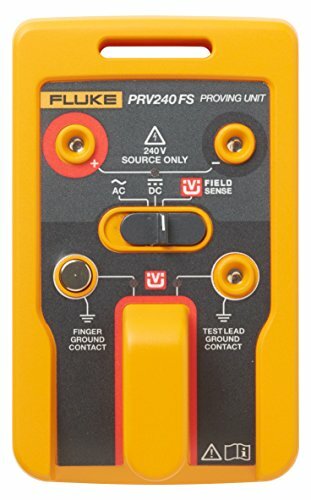 The PRV240FS proving unit will verify the functionality of your T6 electrical tester without unnecessary exposure to shock or arc flash. Quickly and easily check the functionality of your T6, including the new Field Sense technology, against a known voltage source before and after each measurement. The portable, battery-powered PRV240FS can fit easily in your pocket or tool bag. 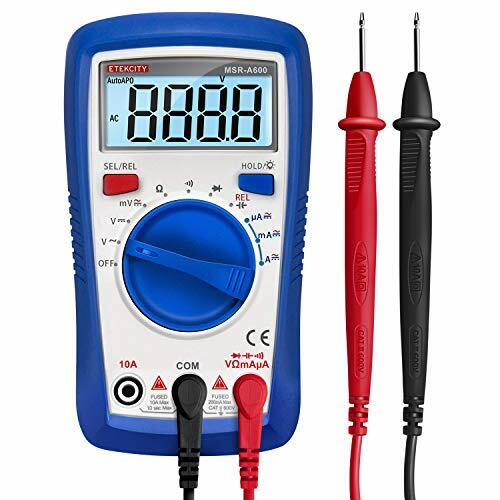 Verify that the electrical tester is operating properly before and after measurements by providing a fast, safe and reliable source voltage. 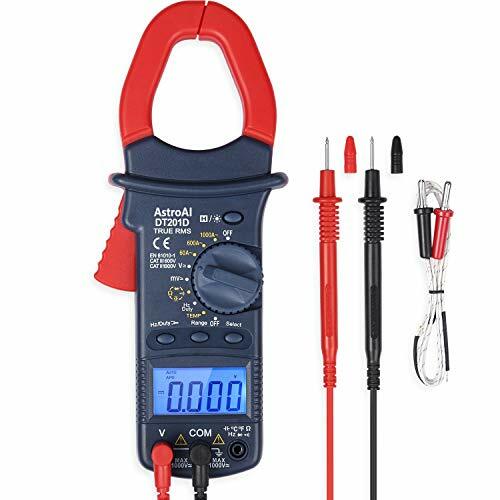 Measurement Mode Gear selection,you can choose the measurement range you want,so that you can use in many situations.Powered by 6 AA batteries (NOT included).This Earth Resistance tester also has Maximum/minimum/average measurement function.It Can also be used to AC/DC voltage measurement and continuity test. Automatic calculation of PI (polarization index) and DAR (dielectric absorption ratio).This Earth Resistance Test the insulation resistance with 250V-2500V voltage. Easy Reading This Digital megohmmeter has Large digital LCD and backlight applied to the meter facilitate users to read the information on LCD.Large-screen high-definition backlight: Press the backlight button to turn the backlight on or off.And this Earth Resistance tester Display: has analog bar and digital dual display function.Under voltage indication.Press Hold button to freeze the displayed value. Press again to release the display. High Quality Material This PM 5205 Earth Resistance tester is a professional instrument in detecting ground resistance of the electrical equipment. Upgraded from the traditional ground resistance meter with its circuit, structure and techniques. Now present as fashionable, precise and easy operational.Thanks to robust housing, compact inner structure, This Resistance Meter offers the perfect features of drop-resistance and super long lifespan. 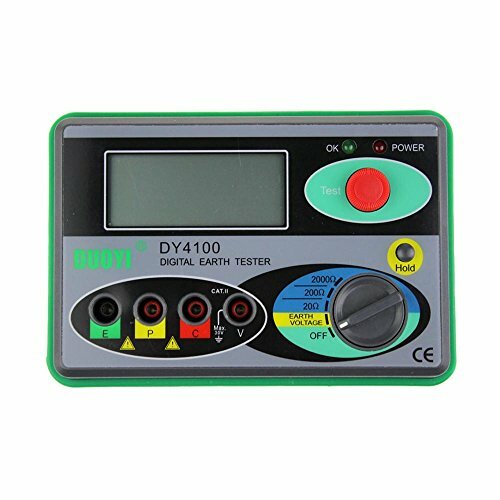 DY4100 Digital Ground Resistance Tester can test earth resistance of various earth systems including power systems, electric equipments, lightning conductors as well as resistance value of low resistance conductor and AC voltage test. This one has more complete functions, higher accuracy, more convenient and reliable for operation and more suitable for outdoor use with dust and wet proof structure. 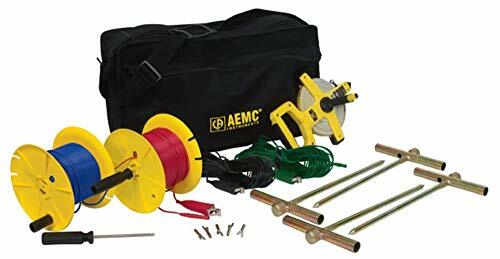 The AEMC 2135.36 kit provides the accessories needed for setup and teardown in the field when performing 4-point ground resistance testing with an AEMC meter (sold separately). The leads are color-coded according to length. The kit includes two 300ft. leads on spools (one red, one blue), two 100ft. 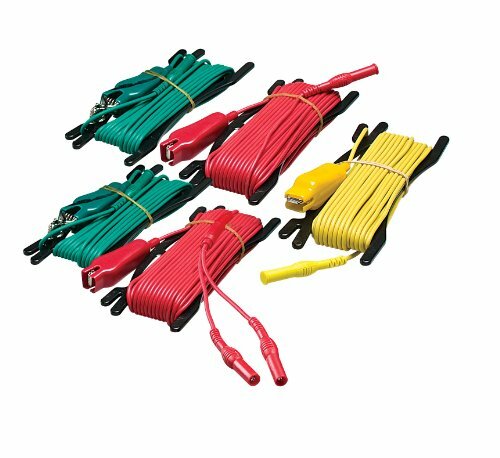 hand-tied leads (one green, one black), two 5 ft. leads (one red, one blue), four 14.5" T-shaped auxiliary ground electrodes, one set of five spaded lugs, 100ft. tape measure, and a carrying bag. The tape measure housing has a hand-crank for rewinding the tape after use and a handle with a rubber grip. The kit includes a carrying bag that holds all of the accessories, keeping them organized and available when needed.